My friend, Polly, had joined me for the Syria/Turkey legs of this trip, and we'd had successes at 34N 38E and 35N 37E in Syria. Most of the unvisited points in Turkey are in the far east of the country - around Lake Van - and unfortunately we would not have time to visit that region on our long march west. However, 38N 39E was simply screaming for an attempt to be made: the DCP website showed it as a lone white square in a sea of 'red' completed visits. And the (only) other attempt (by Ralf Kiefer and Carlo Albrecht in 2004) got to a frustrating 156 m from the target. We optimistically decided that we would nail this troublesome point, no matter how hard it proved to be. We left Aleppo in Syria at about 09:00, and drove to the Turkish border, where we spent two hours getting through red tape, convincing them that I was British, not Irish (don't ask...), and trying to wake up the lone man who sold car insurance. It was a bit of a shock suddenly being in a country where I had no knowledge at all of the language, and English/Arabic got me precisely nowhere. But eventually we got through and hurtled north towards Nemrut Dağı, a major archaeological site near the Euphrates reservoir. Happily, we made excellent time, and much to our surprise we were able to make an attack on the CP the same day as leaving Syria. We first drove to Adıyaman, then turned off to Kahta, before joining the road to Nemrut Dağı. The turn off to the site (37°55'14.23"N 38°48'37.10"E) is well-signposted: here visitors to the point should simply carry straight on towards the CP. Another (misleading) junction is at 37°58'11.73"N 38°53'38.01E, where we made the mistake of taking the road over the small bridge. This leads to a tiny village called Yayladalı; one should actually take the non-bridge road, which winds down to the reservoir in the direction of Gerger. At around 600 meters from the target, we left the surfaced road and descended on a small (but perfectly drivable) track to about 250 m from 38N 39E. A farmer and his wife working on a water pipe paid us no attention at all, and we scrambled down a short bank to get to the reservoir edge. We got to 65 m from the point without getting our sandals wet. This suggests that either the waters have receded somewhat since the last visit (although this couldn't have been by much, as there were plenty of pumps and tracks just by the water line that had clearly been there for some time), or that we had got to a different position than the previous visitors. Regardless, the visit was now already a success, under the '100 m rule' of the DCP. However this, of course, was not nearly good enough for me and Pol, and we pulled out swimwear and a pair of scuba fins from the Landy. Thanks to the previous visitors (to whom we are eternally grateful for their very useful report), we'd assumed that a swim (albeit a longer one) might be necessary. So, the (silly? Pointless? Inspired?) plan was this: I'd swim on my back, whilst wearing the fins for speed and stability, and hold the camera and GPS in the air to prevent them getting wet. Polly would swim alongside, and assist at the point. We hurriedly changed by the bank, and inched our way into the reservoir on the very soft sand that lies beneath the first few metres of water. This enterprise wasn't as daft as it sounds, as the reservoir (being a reservoir) was completely calm. We had some difficulty getting ourselves into position, but eventually got all zeros at the point (although the GPS picture sadly shows us 0.1 of a second off target - this wasn't an easy photograph to take, let me assure you...) and took the pictures for each cardinal direction. To the North, one can see a small boat very close to where we started the swim (but no-one was around to help us enlist its services, alas...) To the East and South are a fine ridge of hills flanking the reservoir. The view to the West is rather obscured by the low-lying sun (our visit was only about two hours before sunset). A good view of the area around the CP can be got from the road overlooking the reservoir, at a distance of about 800 m.
This CP would be on dry land if it were not for the 'Southeastern Anatolian Project', started in 1974. This dam venture set out to ensure (oil-poor) Turkey's energy future. In one sense, this has been a highly successful project, with great prosperity being brought to previously arid areas, and provides a massive (renewable) contribution to Turkey's energy needs. But there has also been a good deal of controversy about Turkey's damming activities on the Euphrates, with a number of settlements being destroyed and the displacement of large numbers of people. And some of Turkey's archaeological heritage (such as the pre-Roman site of Samsat) has disappeared forever. As a result, Turkey's parallel dam projects on the Tigris river (such as the now infamous Ilısu dam) have been largely abandoned. The swim back was much easier - not having to aim for a particular point - and we quickly reclaimed our dry clothes, before scrambling back up the bank and driving off through the amazing scenery of the area to get to Nemrut Dağı before sunset. This is the nearest site of archaeological importance (at around 23 km from the CP), and consists of two temples, a funerary mound, and (most famously) a number of stone heads that were constructed as the burial site for Antiochus I Epiphanes (64-38 BC), an otherwise obscure king of the Commagene civilisation. This tiny 'empire' was eventually absorbed by the Romans after a series of counterproductive political machinations by Antiochus himself - machinations that were no doubt driven by the same delusions of grandeur that prompted him to order the construction of his burial site. We spent the night in a small motel half-way up the summit to Nemrut Dağı, in order to rest after our long and exhausting - but highly fruitful - day. We visited the site itself the following morning, before heading west to the extraordinary landscapes of Cappadocia. In our opinion, a visit to 39N 38E represents a fine diversion for any visitors to Nemrut Dağı, if for no other reason than being able to cool off from a stiflingly hot Turkish summer day. 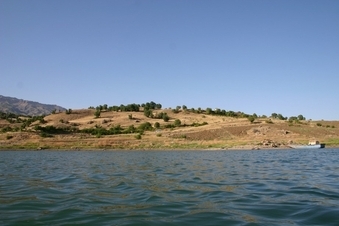 This Confluence is located in the Euphrates reservoir, a couple of tens of metres from the shore.